A. Increase your speed and sound your horn. B. Flash your headlights to warn oncoming traffic. C. Keep to the left and slow down. Correct. Keeping to the left gives other vehicles more room, and slowing down ensures that if you reach the crest and see a previously hidden obstacle on the other side you have more time to stop. Driving on hills requires more anticipation of what might happen ahead. When driving downhill you have a longer stopping distance and when driving uphill your vision of what's ahead can be compromised as you near the crest of the hill. Maintaining control is the most important thing on a steep hill and the way to do that is with your engine and brakes, not just brakes alone. When going downhill, change down one or two gears to let your engine take over some of the braking duties. This will mean that your brakes won't suffer brake fade as quickly. Advanced driving instructors will tell you that high revs are fine as long as you are not over-revving your engine. When you are travelling downhill it will take you much longer to stop - be extremely cautious in icy conditions. Turning a corner on a steep hill will mean that the turn falls away and can create a situation of adverse camber which means you will have less grip. Watch for corners that have damp leaves on them as they will be more slippery. When travelling uphill you may need to change down a gear or two to maintain your speed, especially if you are towing a trailer or your vehicle is lacking in torque (e.g. small engine in a heavy vehicle). Watch your speed to check that you are not inadvertently slowing down and therefore holding other drivers up. You will stop more quickly when going uphill, but this doesn't mean you should tailgate because drivers in front of you will also be able to stop more quickly. In very slippery conditions be careful not to wheelspin otherwise you will lose speed quickly and might not be able to regain it. This applies particularly where there might be ice on the roads. If you have to start on an incline remember that it will take you more time to get up to speed. If you are driving a manual vehicle you will need more revs before you engage the clutch. If your vehicle doesn't have hill-hold technology which holds the brakes on while you transfer your foot from the brake to the accelerator, your vehicle could roll backwards. Make sure you use your handbrake properly to prevent this happening. If you are riding a motorbike your road position in corners is absolutely critical on hills to protect you from other vehicles as well as ensure that you get around the corners safely. 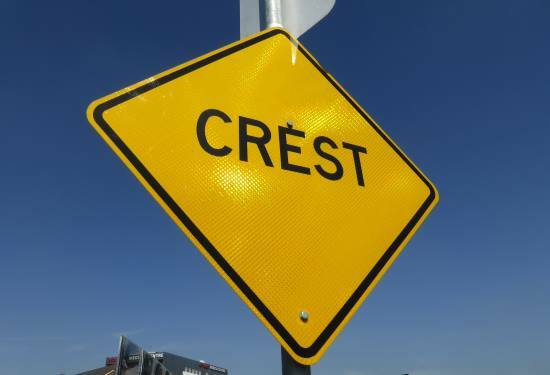 On blind crests there are usually signs to warn you. This will be a yellow diamond with CREST written in it. Depending on how steep the hill is, during the day there could be few clues that another vehicle is approaching. At night you are likely to be able to see headlights. Sometimes you could find wildlife on the road the other side of a hill - animals won't be able to see you coming and the geography of the hill could also make it more difficult to hear your vehicle coming. There may also be driveways the other side of the hill.